Hailing from Cleveland, Ohio, Bone Thugs N Harmony arrived on the scene led by Eazy E's guidance and set a path for themselves. Today, we look at their first two projects and determine which is better, or rather which one we prefer. Let's get it to it. Everytime I hear Creepin On Ah Come Up, I can't think of any other adjective besides classic. 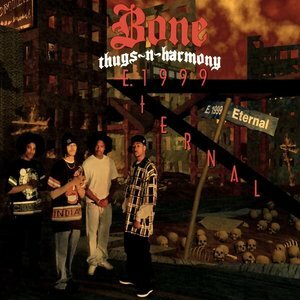 Bone Thugs were purely an unique entity in the manner of how they rapped. You might listen to it at first and think a few tracks are unnecessary. I think this was too short of an EP. This would definitely be on a list of all time great short EP's. It paved the way for the next. E 1999 Eternal is a classic as well. If you don't listen to "1st Of Tha Month" every first of the month, we're not the same kind of man. This is essentially Bone Thugs at their best. There are sounds reminiscent of Creepin on Ah Come Up, but as Kobe says, this is a different animal and the same beast (we still don't get it). The same powerhouse that is Bone Thugs with a deeper level into the occult songs and weed appreciation. Bone Thugs and DJ U-Neek were looking like Rocafella in 2000 with this combination, unstoppable. Please give me whatever they were smoking to create such a masterpiece like this. There were mellow tones like "Tha Introduction" and harder tones like "East 1999" that were so versatile that they can fly back to back without sacrificing any quality of this album. Great piece of work. I think Creepin... is better than E.1999, maybe because it was short and sweet. Sometimes I like albums like that. Now don't me wrong, E. 1999 has some great tracks. Probably their best track "1st of Tha Month" is on that album. 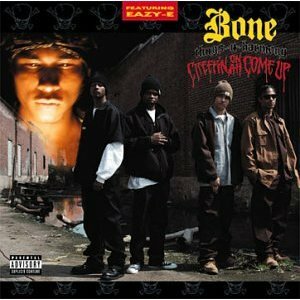 I'm a fan of Bone Thugs, but I could never get through a full project of theirs until I heard Creepin....the production was spooky, hard hitting at times, yet in harmony (pun intended). The best track has to be No Surrender, which I think is better than a lot of tracks off E. 1999. It also has a classic Eazy verse, and a hilarious outro. Maybe I just really loved the "in and out" feel of the EP. Undoubtedly E. 1999 Eternal. This is the album that officially announced their presence. I believe as a whole, this is their best project, as it flows smoothly and cool. With hits such as "Tha Crossroads" and "1st of tha Month", this project is just pretty awesome. Not to mention that this album does stir a bit of emotion inside me. And this is sometimes shocking, being as BTNH's music is normally aggressive but smooth. But yeah, E. 1999 Eternal hands down. I have to go with E. 1999 Eternal. I wrote about that album on SOTB.com and long story short, I think its easily the all around better album. Creepin is a good EP but E. 1999 all the way. What about you? What do you choose? Let us know in the comments below.